Dillon Lloyd Buck Promo — WETHEPEOPLE BIKE CO. The honor of a “signature frame” is not something we feel should be given out lightly. Now in our 20th year as a BMX company, and with a long history of signature frames hanging on these walls we make sure every detail is correct. When we first sat down with Dillon to work on his signature line, we knew that we wanted his frame to embody everything about Dillon that we all knew and loved. It needed to hold up to Dillon’s style of riding. The Dillon Lloyd’s signature BUCK frame is a straight up burly beast designed take all the abuse you can throw at it, and stand up smiling and wanting to do it all over again, whilst you’re still on the floor dusting your self off… Combining a taller 127mm head tube, 7mm thick invest cast dropouts, and dent-resistant oval chain stays, the BUCK is one of our most advanced frames yet. 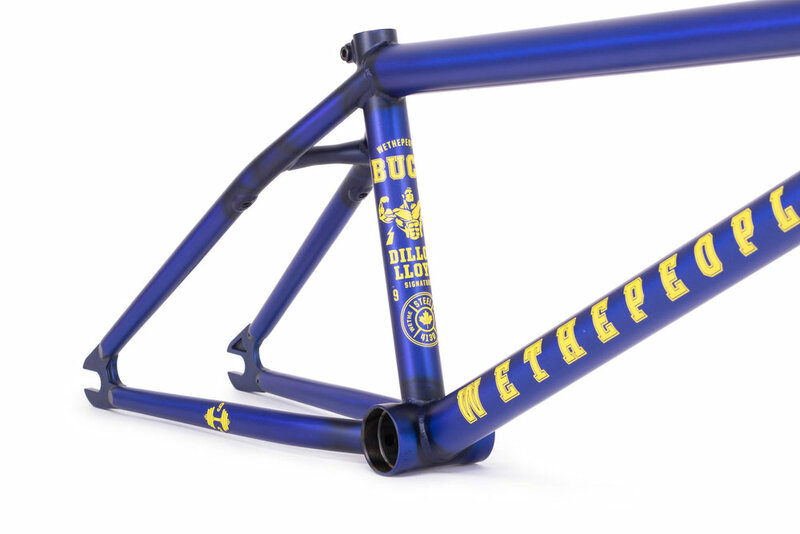 Dillon designed the BUCK with a steep 75.5 degree head tube and higher 11.8” bottom bracket allowing it to be quick and nimble for technical riding, but he raised the stand over height and kept the chain stays at a solid 13.5” preventing you from looping out when you’re dropping the landing gear and coming in hot.